The M44 Waffen SS Wool Field Cap, was a single button closure cap and became a favorite of German SS troops. 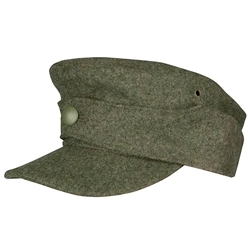 These field caps are made in Germany from the highest quality wool which has been custom made to match the original field grey wool colors from WW2. Each comes fully lined with typical gray cotton fabric and proper ink maker marks. They also include the correct visor inserts, keyhole buttonholes and pebbled aluminum buttons. Due to high quality and attention to detail, these field caps can be listed as Collectors Grade pieces; but don’t let that fool you, they are tough enough to stand the rigors of WWII reenactment use! Marked in German Army sizes. Sizes: 56 (US size 7), 57 (US size 7-1/8), 58 (US size 7-1/4), 59 (US size 7-3/8), 60 (US size 7-1/2), 61 (US size 7-5/8).